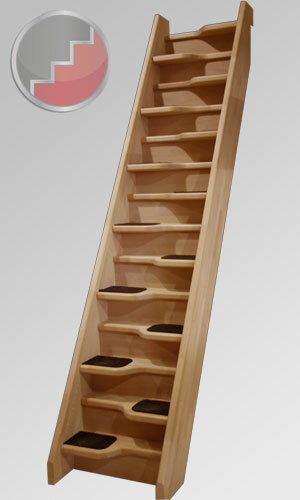 The Beech 40 compact loft space saver staircase is the most robust spacesaver staircase available. Its 40mm treads and string sections make it a class leader in the Space Saver market. This solid spacesaver staircase is constructed with 40mm steamed beech strings, 40mm steamed beech treads and 9mm beech veneered risers. Optional European style balusters and handrails are available and carpet inserts (as shown in the picture) can be machine recessed into the treads during production. The Beech 40 is also available as an openplan spacesaver staircase with riser bars. The Beech 40 spacesaver staircase is manufactured to the highest standards with the full paddle of the tread and the risers recessed into the strings. The staircase can be manufactured in any width up to 800mm with up to 16 risers. 90° landing turns are available as a bespoke feature on this staircase. This spacesaver staircase, which can be delivered fully assembled or flat packed for assembly on site, may be ordered online through our TradeStairs website. Alternatively fill in the form below for a quotation or give one of our sales advisors a call on 01952 608853 to place your order, for more information or for a quick quotation.